With the word ‘green’ filtering through every marketing campaign, news story and water cooler chat session, there should be no doubt that automakers would be attacking the eco market with newfound gusto. For 2009, we see the growth of two major green vehicle categories: the steadfast hybrid, which has become increasingly popular in recent years, and the clean diesel, brought over by German manufacturers to give buyers a more robust and fuel-efficient drive. Here’s what’s new with these gas-sippers. The biggest news in the hybrid market is the reinvention of Honda’s Insight for the 2010 model year – available spring 2009. Despite it not being a full hybrid, meaning it will rely on gas for power at all times, it’s looking at 41 mpg combined. While nothing has been confirmed, Honda plans on pricing the familiarly styled four-door lower than the Toyota Prius – around $18,000 to start. Because of this, the Prius must remain close to its current MSRP of $22,000 to stay competitive. Toyota’s 2010 Prius will feature improved aerodynamics and a larger 1.8-liter Atkinson-cycle engine to bring fuel economy up to 50 mpg combined. Body styling matches more closely with Toyota’s lineup, and the new model supplies a larger amount of interior space. Not all of the new hybrids cater to the budget buyers. Lexus is planning to introduce their first dedicated hybrid platform in the HS250h. The luxury sedan will squeeze between the IS and ES models, featuring a hybrid system and an efficient 2.4-liter Atkinson-cycle engine. Meanwhile, the Mercedes-Benz S400 Hybrid has generated major buzz as the first production car to use lithium-ion batteries to help power the gas engine. With the new power source and a ‘mild’ hybrid setup, it’s looking to produce 30 mpg. The more powerful BMW 7-Series Hybrid and its two-mode hybrid system should easily compete with the S400. BMW claims the hybrid should improve mileage by 15 percent over the gas engine, even though the V-8 will deliver a devastating 407 horsepower. All of these models are arriving late 2009. Some people need the space and functionality that an SUV provides, but that doesn’t mean they have to shun fuel economy. A successful pairing of its two-mode hybrid system and a 6.0-liter V-8 in the luxury-minded 2009 Cadillac Escalade Hybrid allows it to get a surprising 20 mpg in the city. 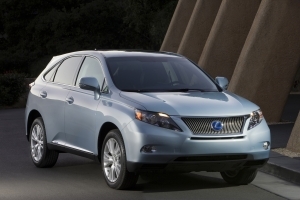 If you think you’d be better off with a smaller hybrid SUV (and lower price tag), consider the 2010 Lexus RX450h. The rig seats five instead of seven but averages 27 mpg with its 3.5-liter V-6 Atkinson-cycle engine and hybrid motor. The newly redesigned RX is fully stocked with techy bells and whistles too. Hybrids aren’t the only ones in the game though, and 2009 brings with it innovative clean diesel technology. Diesels deliver more torque from of their powerplants, making it easier to incorporate the technology into larger, heavier vehicles. Beginning this year, there are five clean diesel SUVs on the market that get significantly better mileage than their gasoline brethren. The Mercedes-Benz ML320’s 3.0-liter V-6 diesel engine can deliver 210 horses and 398 lb-ft of torque while getting 600 miles to the tank. The larger GL320 has many of the same strong qualities, including the same V-6 engine, but it seats seven in its larger interior. Because of its weight, gas mileage drops to 23 mpg on the highway, one less than the ML. Clean diesel does hold somewhat of a premium, and the GL and ML ring in at $58,000 and $48,600 respectively. The company’s crossover, the R320 BlueTEC, seats six in its more streamlined wagon design. It also returns strong highway mileage at 24 mpg. You can have it starting at $49,150. With its 3.0-liter six-cylinder engine, the new $51,200 BMW X5 xDrive35d produces more power than its Mercedes-Benz competition and receives better fuel economy, at 26 mpg highway. VW and Audi are bringing two yet-to-be-priced SUVs to the table this spring. The Touareg V6 TDI receives a 25 percent increase in fuel economy to bump it up to 25 mpg on the highway and features a luxury interior that matches those of more expensive SUVs. EPA estimates for the larger Audi Q7 have not yet been released, but the 3.0 TDI should easily be capable of 25 mpg on the open road – an impressive improvement over the gasoline V-6’s 19 mpg. As with all Audis, the standard feature list runs deep and quality is top-notch. SUVs aren’t the only ones having fun; diesel engines are also being added in sedan platforms, to much success. BMW expanded its green repertoire to include the ever popular 3-Series. The 335d’s twin-turbo can deliver 265 horsepower and 425 lb-ft of torque while dispensing 23 mpg city and 33 mpg highway. The $43,900 sedan also significantly undercuts its rival, the $54,200 E320 BlueTEC. Mercedes-Benz’s engineering produces an equivalent amount of fuel economy to the BMW, but less power. But we’d expect nothing less than fine quality and an unmatched standard feature list from the Stuttgart native. Too rich for your blood? Then the new 2009 Volkswagen Jetta TDI should fit the bill. The turbocharged 2.0-liter engine helps it reach a hybrid-topping 41 mpg on the highway. For half the price of the 335d at $22,270 for the sedan and $1,600 more for the SportWagen, you’ll get a diesel worth its weight in unleaded. A lengthy research and development process means that the car market does tend to take a while to catch up to social and economical movements – the dozen or so new luxury vehicles are a testament to that, but we’re still astounded by the sheer variety of the new models. While we’re waiting for even more options to appear, these ahead-of-the-curve vehicles show that the field of green has truly taken root.